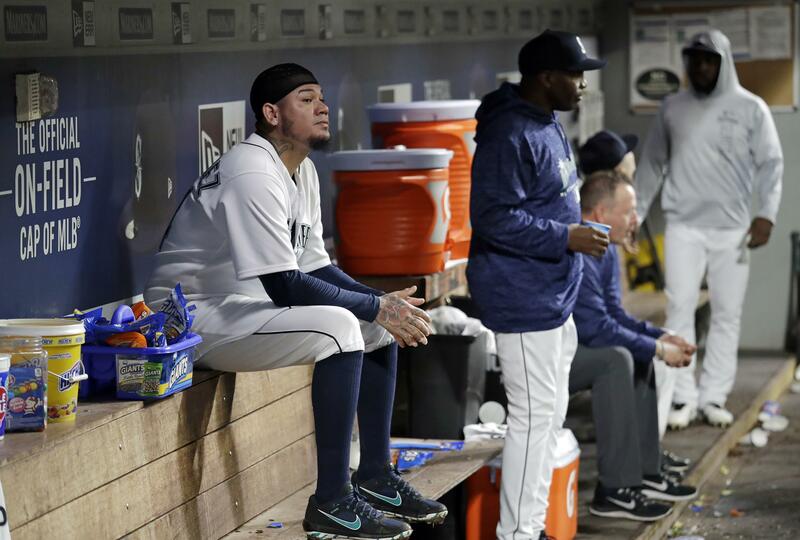 UPDATED: Tue., March 12, 2019, 9:30 p.m.
SEATTLE – If there was a button that would time-travel Felix Hernandez to Sept. 30 of this year, he would have pressed it in an instant. That’s the day after the Mariners’ regular season ends, and for Hernandez, the first day of guaranteed relief. Hernandez is a shadow of a shell of his former self and may have less talent around him than he has had in his MLB career. This is going to be bad. But it’s up to Felix not to make it worse. The headline out of Peoria, Arizona, on Sunday was Hernandez’s discontent over M’s manager Scott Servais naming Marco Gonzales as the team’s opening-day starter. The decision marks the first time Felix won’t take the mound on Day 1 since 2008. These weren’t scorched-earth reactions that will drive an immediate wedge between Hernandez, his teammates and Servais. Regardless of the $27 million Felix will receive in this final year of his contract, everyone understands that regression still hurts. In the past five years, Hernandez’s ERA has ballooned from 2.14, to 3.53, to 3.82, to 4.36 to 5.55. Throw in the seven earned runs he allowed in three innings Sunday, and a 2019 resurgence seems closer to impossible than it does improbable. So Servais, Gonzales and others likely sympathize with Hernandez’s hurt. He has a lot to be upset about. He doesn’t, however, have anything to complain about. I predict we learn more about Hernandez’s character this season than in any of his previous 14. Even in the free fall that was 2018, he was still the opening-day starter and spent minimal time out of the rotation. But now he’s beginning the season as the No. 5 starter on a team Fangraphs is projecting to win 75 games. He’s all but guaranteed to extend his career-long playoff drought on the only major-league team for which he has played. When you’ve been the anointed one for most of your career, a fall from grace can easily be accompanied by a lack of grace. So, Hernandez, tempting as it may be – resist the urge to sulk. Richard Sherman’s accomplishments will always make him one of Seattle’s more appreciated athletes, but his antics over his final couple of seasons with the Seahawks docked him some points on the love scale. Earl Thomas was the most talented member of the Legion of Boom, but between him asking Cowboys coach Jason Garrett to “come get me,” and then flipping off his own sideline in his final game as a Seahawk, his once-pristine legacy will be permanently tainted. Hernandez doesn’t seem to possess the same personality traits as the aforementioned Seahawks. He doesn’t pop off. He doesn’t complain of “disrespect.” He has been ejected from only one regular-season game, and that was on his way to the dugout after being pulled. But he is also about to undergo a unique experience for him. Any frustration Hernandez may have felt last year was tempered by the fact that, for most of the season, the M’s were in the playoff hunt. Prolonged resentment about losing his place in the rotation would have been interpreted as selfish given the circumstances. But postseason hopes won’t be in play this year. As my colleague Ryan Divish pointed out, Servais and Mariners GM Jerry Dipoto have not experienced a dominant Hernandez in their three seasons in Seattle. This isn’t like Gregg Popovich yanking Tony Parker from the starting lineup after four titles together. This has the potential to get tense. But if I’m Hernandez, I’m using my (likely) last season in Seattle to be the best teammate possible. I’d do my best to transition from pitching master to pitching mentor, all the while competing to get back to the top. It’s hard to smile when you’re angry, hard to be enthusiastic when you’re struggling, hard to stay poised when you’re unraveling. But anyone who manages to keep it together is always happy that he did. Hernandez isn’t going to go out on top in Seattle, and it’s unlikely he’ll go out with the proverbial bang. But he can go out with class. Given the circumstances he’ll be facing, that would be an accomplishment. Dustin Ackley’s reunion with the Mariners has ended before the 2019 season. The Mariners’ former first-round pick of the 2009 draft – No. 2 overall – was given a chance to come back to the organization that drafted him in hopes of getting a chance to compete for a spot on the big league roster and perhaps a job with Triple-A Tacoma. But on Tuesday, the Mariners announced they had released Ackley, who came to camp as a nonroster invite on a minor league contract. Ackley appeared in 11 games, going 3 for 12 – all singles. He is now a free agent, but given his lack of production over the past few seasons, his playing future is in doubt. The Mariners also reassigned outfielder Tito Polo and infielders Tim Lopes and Orlando Calixte to minor league camp. All three players are expected to play for Tacoma this season. While most teams in the Arizona valley didn’t mind a rain day to give their players some extra rest, it was an issue for the Mariners as they try to get their pitchers work in a truncated Cactus League schedule and a departure for Japan on Thursday. Seattle had its game with the White Sox canceled by the rain. Left-hander Yusei Kikuchi was scheduled to start the game. The rainout follows a drizzly Monday night game in which the Mariners scratched Wade LeBlanc. Both pitchers need to get their work in, and it will happen on what figures to be a busy Wednesday. Gonzales is scheduled to start Wednesday night vs. the Giants at Peoria Stadium. Published: March 12, 2019, 4:43 p.m. Updated: March 12, 2019, 9:30 p.m.